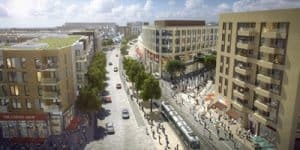 Hines, the international real estate firm, has warmly welcomed the decision by Dún Laoghaire-Rathdown County Council to approve plans for a new 2.1 million square foot town centre development at Cherrywood. The €1 billion mixed-use development will include 1,269 build-to-rent apartments, 585,000 sq. ft. of retail and office space as well as high-amenity leisure space. This approval now paves the way for the commencement later this year of the largest single urban development project in Ireland. Located between Cabinteely and Loughlinstown in South County Dublin, Cherrywood Town Centre will be constructed on an elevated site integrating the existing Luas stops of Cherrywood and Bride’s Glen. The dynamic new urban quarter will prioritise pedestrians and bike users and will incorporate both covered and open public spaces as well as an extensive array of shops, bars and restaurants, and a 200-room hotel and other leisure facilities. It is expected that construction on the three-year project will commence in Q4 2018 and provide 3,000 construction jobs. Cherrywood Town Centre will in time provide housing for over 3,200 people, office accommodation for 2,300 and employment for an additional 2,500 retail and leisure workers. 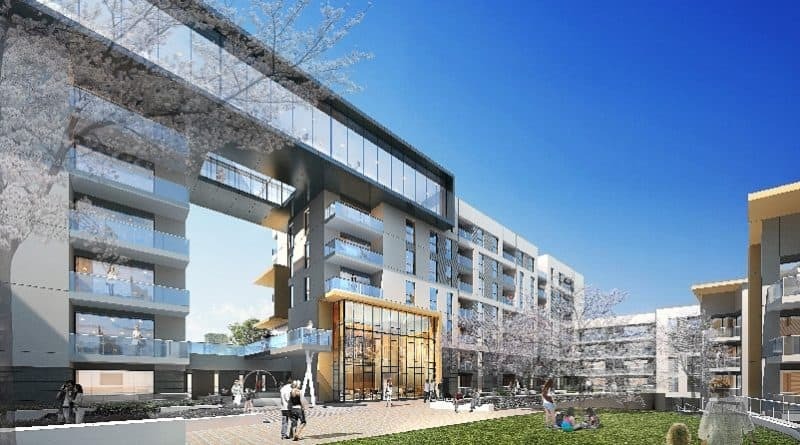 The residential element of the Town Centre project is being developed in a joint venture agreement involving Hines and Dutch pension investor, APG Asset Management (APG). Commenting on the Council’s planning approval, Brian Moran, Hines senior managing director, said, “We would like to thank Dún Laoghaire-Rathdown County Council for giving their stamp of approval to the Cherrywood Town project, which will form the centrepiece of the wider Cherrywood strategic development zone (SDZ). We can now bring to reality the great vision for this Town Centre – which will be a modern, vibrant and healthy urban environment for families, workers and visitors alike. Our new open-plan apartments will incorporate the latest designs in apartment living and we believe the active streetscape environment has the potential to become the blueprint for future urban design in Ireland. Today’s announcement also comes as we complete construction of the first phase of our infrastructure development project at Cherrywood, which includes three brand new flagship parks, a state-of-the art all-weather multipurpose pitch, six new tennis courts and a sports pavilion, 5.4 kilometres of roadways, pedestrian footpaths, cycle paths, greenways and over 3,000 trees. We are also delighted to announce that Hines has applied the principles of the international-recognised WELL Community Standard to its design with a view to Cherrywood becoming the first WELL-certified development in Ireland and only the third in Europe. WELL is considered the premier global building standard and is viewed as a highly progressive means of supporting public health and well-being. In addition to the Town Centre project, Hines has just submitted a new planning application for 146 apartments, situated at the junction of Bishops Street and Tullyvale Road, its first application outside of the Town Centre. The apartments will consist of 1 bed, 2 bed and 3 bed units built over 4 blocks. Hines also recently submitted a separate planning application for the first new school within the Cherrywood development. The Primary School at Tully Park is designed to accommodate up to approximately 700 primary pupils in 24 south-facing classrooms, with a dedicated special needs unit, a school hall, 192 bicycle spaces, green roofs, large outdoor play/courts area and sensory garden.